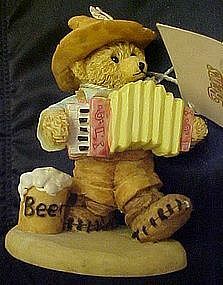 Cute teddy bear dressed in traditional German attire with beer and accordian. This is from the 1998 Bears around the world collection. This one comes complete with the statistics tag of his country. Capital, population, languages, square miles & currency. Measures almost 4" tall. Perfect condition. I have many others from this set I will be listing.